Windows 10 runs the the optimization task once a week by default. You may have noticed periods in which the operating system became less responsive, and that may have been caused by defrag operations running in the background. The use of third-party programs to optimize drives is another reason for disabling automatic defrag or TRIM optimizations in Windows 10. So, how do you get to the "Optimize Drives" interface shown on the screenshot above? Switch to the This PC display. Right-click on any drive connected to the computer and select Properties. Switch to the Tools tab in the drive's properties window. Activate the optimize button under "Optimize and defragment drive". The Optimize Drives interface lists all connected drives that are mounted in the interface. You will notice that drives without drive letter are not listed in the interface even though they may be connected to the system. Each drive is listed with its name and drive letter, its type, status, and the time and date optimizations were run on the drive. Note that you cannot refresh the listing once it is open. If you connect a drive after opening Optimize Drives, you need to close and reopen the interface to find it listed under drives. The type of drive determines which options are available to you. Optimize is available for all drive types; the type of optimization depends on the drive type with defragmentation being run on platter-based hard drives and TRIM operations on Solid State Drives. Analyze is only available for platter-based drives. Analyze checks the drive's fragmentation status and updates it in the interface after the analysis completes. Scheduled optimization information is displayed in the lower part of the interface. It highlights whether scheduled tasks are enabled and the task's interval. A click on "change settings" opens a menu that you may use to disable automatic drive optimization or change other parameters of the maintenance task. Enable or disable scheduled optimization of drives. Change the frequency from the default weekly interval to daily or monthly. 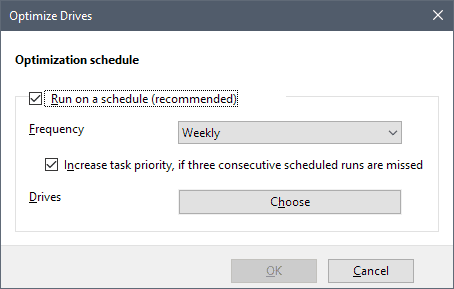 Disable the task priority increase feature if three consecutive scheduled runs are missed. 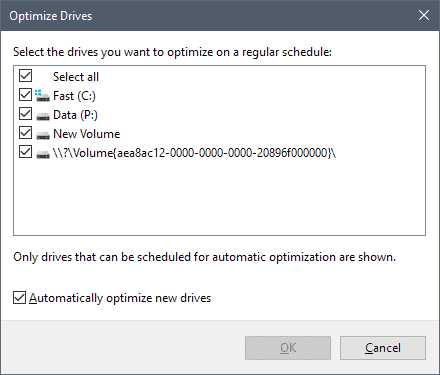 Customize optimizations for individual drives. You may use the last option to turn off automatic maintenance of some drives; useful if you don't want certain drives to be included in the optimization. You may disable the automatic inclusion of new drives in optimization tasks in the configuration menu as well. While you can manage the optimize drives tasks using the configuration interface, you may also disable it using the Windows Task Scheduler. Type Task Scheduler, and select it from the list of results. Go to Task Scheduler Library > Microsoft > Windows > Defrag. 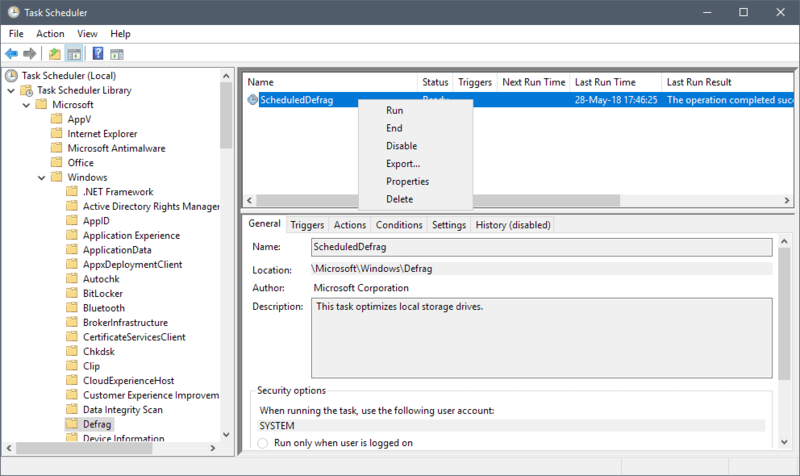 Right-click on the ScheduledDefrag tasks and select disable from the context menu. 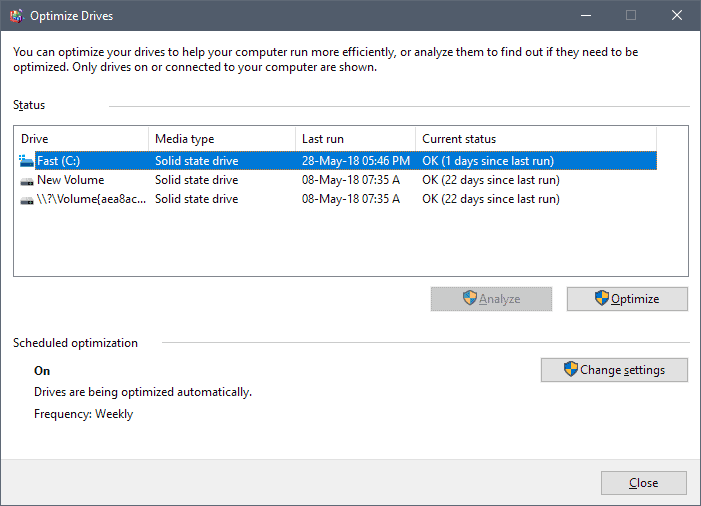 Find out how to manage automatic drive optimization tasks in Windows 10 that run defragment or TRIM operations on connected drives automatically. By default, Win 10 auto-defrags a HDD once a week. If the user unknowingly runs programs while Win 10 is auto-defragging the hard-disk in the background, won’t this corrupt the system or files.? By default, Win 7 also auto-defrags a HDD once in 2 weeks or fortnightly. I think it is safer to defrag the hard-disk manually and not run any programs while it is being defragged. ……. A defrag can take about 30 minutes to complete. .
I’m pretty sure it will only run if the computer is in idle, and as soon as the user does something it pauses/stops it. AnorKnee Merce, I don’t think it’s possible to end up with corrupted files if you are actively accessing the drive while it is defragmenting. Worst case would be if you’re accessing a fragmented file, while Windows runs defragmentation, that particular file will remain fragmented, where it was physically at the beginning of the operation. It is why you sometimes end up with something like 1% fragmented, right after you run a defragmentation. Just don’t bump the HDD while defragmentation runs. Tracks are so close to each other that the head may jump and (over)write to an adjacent track. This will lead to serious data corruption. No. Defragmentation (since at least Windows 2000) uses Executive Software’s (Diskeeper) defrag engine, and is safe to run while the computer’s in use. Windows is smart enough not to move data while it’s being used or written to.